Hai Phong is located on the northern arm of the Red River Delta, a vast dumping ground for the rich silt picked up during the Red River’s long 750 mile journey (1,200 km) through southwestern China and out into the Gulf of Tonkin. Hai Phong is also located near huge coal deposits, which helped turn the city into a center for industry. Although it has a strong commercial and industrial base, the city itself is delightfully colonial mixed with modern construction. Cultural attractions abound, including temples, shrines, pagodas, mausoleums, museums, art, architecture, and restaurants that serve up delicious local fare. You’ll also find beautiful beaches, lots of shopping, and an exuberant nightlife scene. 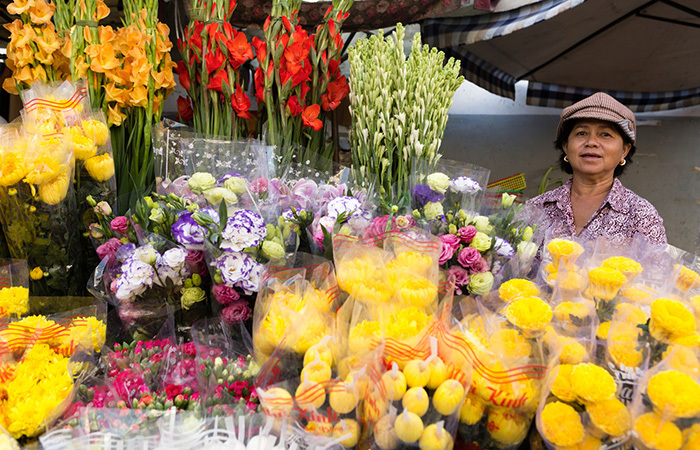 One of Hai Phong’s most iconic sights is streets lined with Flame of the Forest trees, which delight the eyes with their bright red blooms during the summer months. The annual Red Flamboyant Festival in May brings art troupes from all over Asia as well as other performances and exhibits to celebrate the vivid flowering of the trees. Northern Vietnam has two seasons: hot-and-wet and cool-and-dry. While Vietnam is a beautiful place to visit at any time of the year, spring (March and April) and fall (September through December) in the north, where Hai Phong is located, offer the most equable temperatures and best chances of cooperative weather. Built during the Le Gia Tong dynasty of the 17th century, this Buddhist pagoda reflects an ancient and respected building style from the 10th century, including Indian- and Cambodian-style roofs in the alter rooms and more recent artistic additions from the early 20th century. The beautifully constructed pagoda is overlooked by a bell tower and is nestled among serene gardens. Visitors can enjoy the peaceful quiet, bring bread to feed the turtles and fish, and revel in the artistry evident all throughout the compound. Please dress respectfully when visiting this holy site. Built in 1717 to honor a Vietnamese hero named Ngo Quyen, the communal house was moved in 1841 from the original Khen Village to its current position on Hong Khen Street. 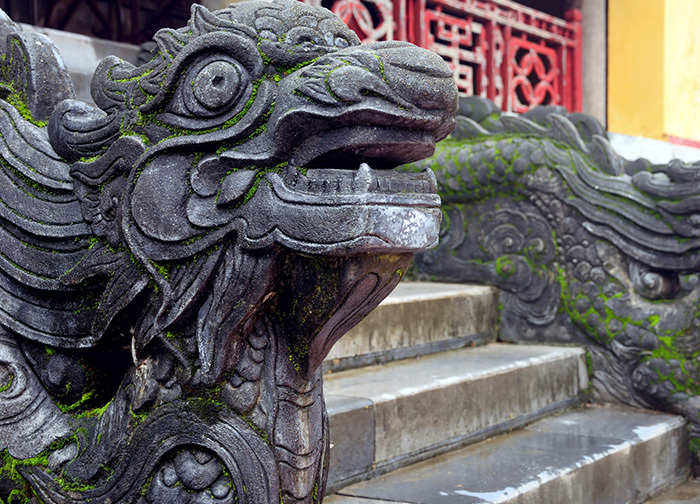 The structure is used as a temple by the community, and it is renowned for the exquisite woodwork used in the construction as well as the 300+ brightly colored dragon images and statues contained within. The site is open to visitors all year round and often houses festivals and religious ceremonies. Find the Hong Khen Communal House in Du Hong Khen Ward in the Le Chan District. Located in Hai Phong’s city center, the Municipal Theater is home to many important celebrations and events throughout the year. Designed by French architects and built using imported materials, the theater is designed to hold up to 400 people. The ceiling of the theater is painted with frescoes and flowers as well as the names of famous writers and artists. Outside, Theater Square provides a peaceful and beautiful oasis from the city, with fountains, flower gardens, and sparkling lights. Call ahead or check with your hotel concierge for public opening times and dates, as these change according to the theater’s event schedule. What the museum lacks in quantity, it makes up for in quality. Housed in a beautiful Gothic colonial building, the museum displays artifacts from Hai Phong’s past, including finds from ancient nearby tombs, ceramics, taxidermy, and remnants of war in the garden area—all with written English translations. For those looking to understand Hai Phong’s role as an important seaport over the centuries, a visit to this museum is a must. Be advised that it is only open four days a week for a couple hours at a time, and plan your sight seeing schedule accordingly: Tuesday and Thursday from 8am – 10:30am, and Wednesday and Sunday from 7:30pm – 9:30pm. For those interested in Vietnam’s war history, this museum has it all. Established in 1969 by the Political Bureau of Military Region III, visitors will gain a better perspective of the fierce desire for independence against colonizers and foreign invaders that the native Vietnamese have exhibited throughout the decades, including France’s colonization in the 18th and 19th centuries and U.S. imperialism in the 19th and 20thcenturies. Exhibits include fascinating war detritus such as bombs and other weapons. Open Monday through Friday from 7:30am – 11am, and 1pm – 4pm. Closed Saturdays and Sundays. On the road from Do Son Resort to downtown Hai Phong, the Navy Museum in contained in a ship anchored next to the Rao Bridge. The museum explores Vietnam’s naval exploits in the navy’s quest to gain independence throughout the 20th century, and it is a popular museum sought out by war veterans from both sides of the various wars. 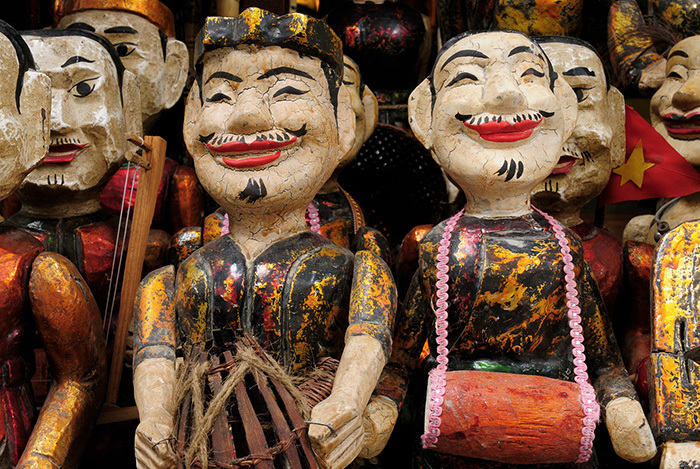 The museum is packed with seafaring artifacts as well as information about important Vietnamese naval battles. Admission is free, and opening hours are on Tuesday, Thursday, and Saturday from 8am – 11am. 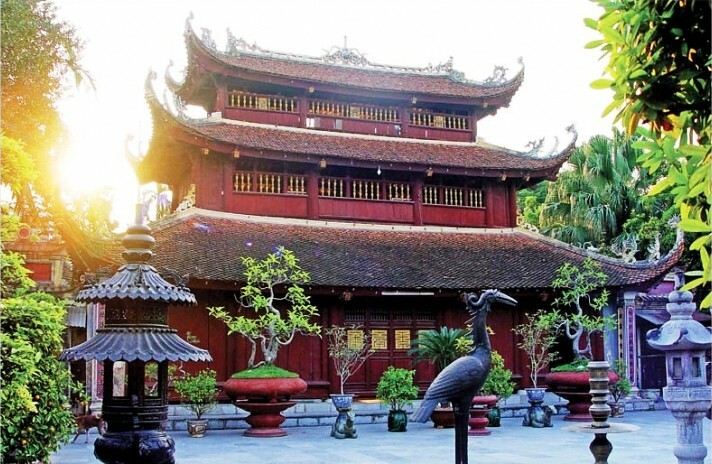 The Nghe Temple, once a small shrine and later built into a more impressive temple, honors Hai Phong’s founder, the female General Le Chan, who worked under the Trung sisters to help repel Chinese invaders in 43 AD. Locals consider it an important religious site, so please dress and act respectfully. Visitors will be fascinated by the intricately carved stonework that adorns the walls, roof, and steps of the temple. The temple is open all year round. Originally built in 1928 by the French Governor-General of Indochina, Bao Dai Villa was later offered to Vietnam’s last emperor, Bao Dai, in 1946. The emperor loved to visit the villa during summer excursions to the Hai Phong area, enjoying the exquisite views of Do Son Peninsula. Today, the villa is a hotel where guests can pore over old royal photos, try on royal costumes (and take picture souvenirs), and see Bao Dai’s throne as well as taking in the beautiful views. The villa is open to guests all year round. Enjoy a pleasant walk under the trees along the lake’s shore and visit the Flower Market on the eastern side of the lake. The flower market is comprised of five splendid arched-roof kiosks built in 1941 by the French as a beautiful place in which to buy fresh flowers. 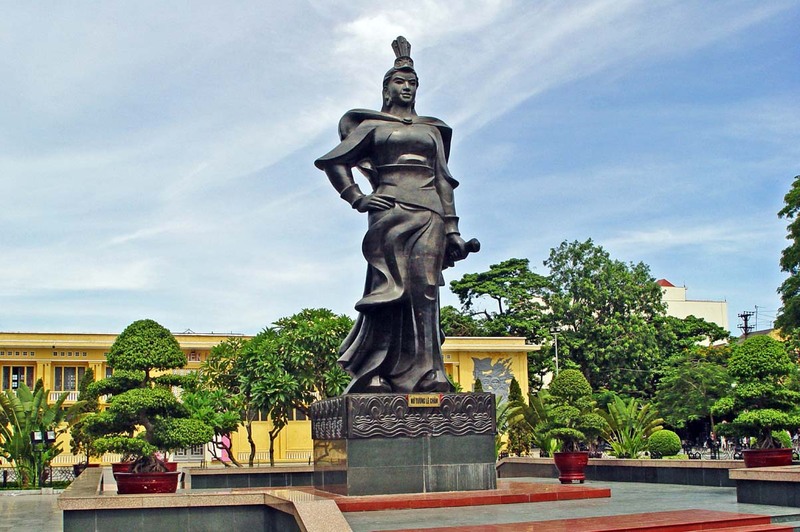 Also within easy walking distance of the lake and market is a massive bronze statue of the female General Le Chan, ancient Vietnamese hero and founder of Hai Phong city. Dien Bien Phu Street and Tran Hung Dao Street have survived many conflicts to become part of the city’s Colonial Quarter, a bastion of surviving French architecture and charm within Hai Phong. Grand colonial buildings, mature trees that line the broad streets, and a thriving café culture all speak to the French influences that helped create this part of old Hai Phong. Stroll the boulevards and gaze at the beautiful buildings, and top off the afternoon of sight seeing by enjoying a drink and a snack at an outdoor café while watching the crowd go by. Cat Ba Island is the largest island in Ha Long Bay, a body of water littered with majestic limestone karsts in a blue-green sea. Cat Ba Island is large enough to support a town, and this town is the most popular overnight stop on Ha Long Bay cruises. Stay a few hours or a few days while you explore the mysterious caves, beautiful beaches, and rugged national park on the island. It’s easy to book transportation from Hai Phong Bay, and travel time from the port to the island takes about 45 minutes, with another 15 minutes of travel by bus to Cat Ba Town. 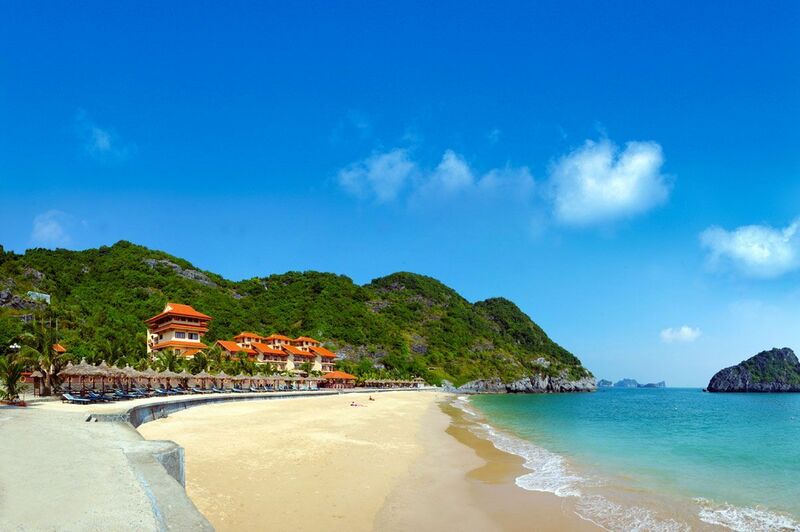 22 km (14 miles) from Hai Phong lie the three beaches of Do Son as well as the country’s only casino. What was once a popular resort area for the French is now popular among the Vietnamese—especially sun seekers traveling from Hanoi. Relax on the white sand beaches, visit the remains of an ancient clay tower and Buddhist temple on Ngoc Son Mountain (including the famous temple bell that was submerged in water for several centuries after a large storm knocked it out of its place), and watch traditional buffalo fighting during the annual Buffalo Festival in September or October (you’ll want to arrive on the 9th day of the 8th month according to the lunar calendar to see the fun). Because Hai Phong is a harbor city, fresh seafood is widely available for some of the most delicious dishes you have ever tasted. The most famous of the traditional Hai Phong foods rely on the daily catch for their main ingredients. Chewy brown rice noodles and two types of crab meat cakes, pork balls, and beef simmer in a luscious broth cooked with greens. The soup is usually served with a plate of shredded lettuce and perilla leaves. Depending on the restaurant or street vendor, you might also get chilis and nuts added to your bowl. This is comfort food Hai Phong style, a light and delicious meal that will make your taste buds tingle. 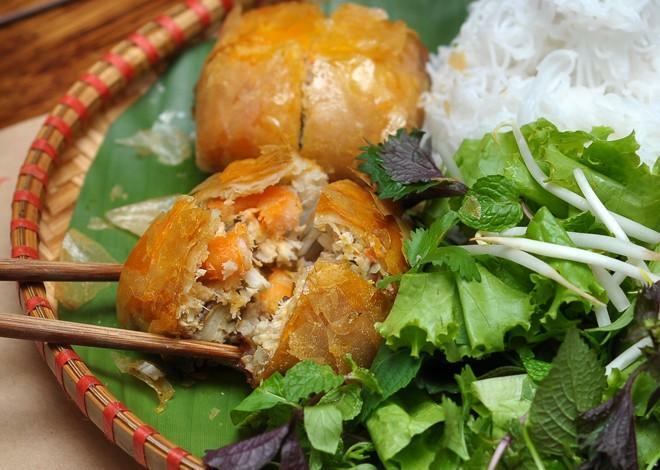 These square spring rolls are packed with a stuffing of ground crab meat, ground crab tile, lean pork, kohlrabi, carrot, ear mushrooms, bean sprouts, rice paper, vermicelli, and seasonings. The rolls are often served alongside rice vermicelli, lettuce, and chopped cucumber as well as a sweet-spicy-salty-sour dipping sauce. For fans of traditional cylindrical Vietnamese spring rolls (nem ran), nem cua be will not disappoint. Cool red jellyfish salad is the perfect antidote to the hot, sweltering days of Hai Phong’s summers. 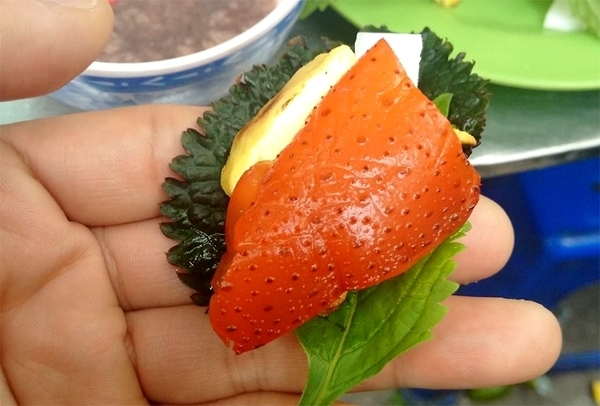 Red jellyfish is flavored with lemons, kumquats, and other seasonings before being sliced into bite-size chunks with a bamboo knife. The slices are served with grilled tofu, young coconut, mint, perilla, and shrimp paste. The fish noodle in Hai Phong combines flavors of the sea with flavors of the countryside. Both saltwater and freshwater fish are used in this soup, including parts of the fish that Westerners usually don’t consider edible: the bladders, stomachs, and heads—all of which impart a unique and delicate flavor to the soup. Vegetables and noodles are added to the broth, making this a satisfying meal in a bowl. Nothing beats a bowl of hot soup in the winter, and lau cua dong is Hai Phong’s remedy for chilly weather. An aromatic bone broth is packed with freshwater crab meat, beef, fried fish, tofu, vegetables and mushrooms before being ladled into large bowls. Cakes of pounded rice, sesame seeds, peanuts, and coconut are boiled before being placed in a bowl and drenched in a sweet-salty sauce. 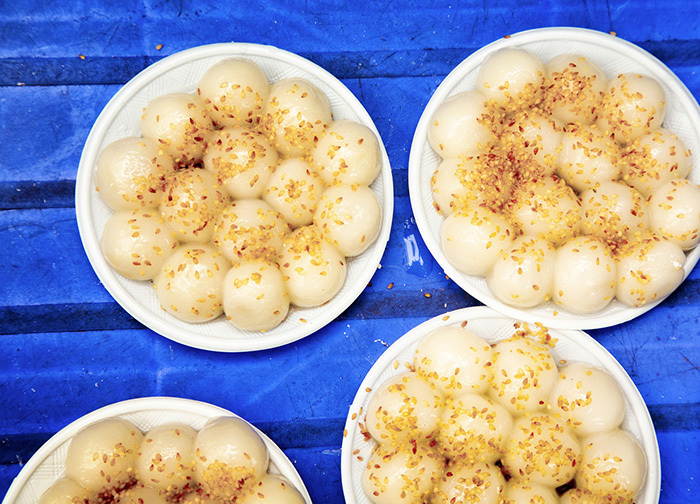 This popular street food was brought to Hai Phong by Chinese immigrants living in Ho Chi Minh City (Saigon).